The Chocolate Muffin Tree: Shamrock Apple Printing and Other Stuff! 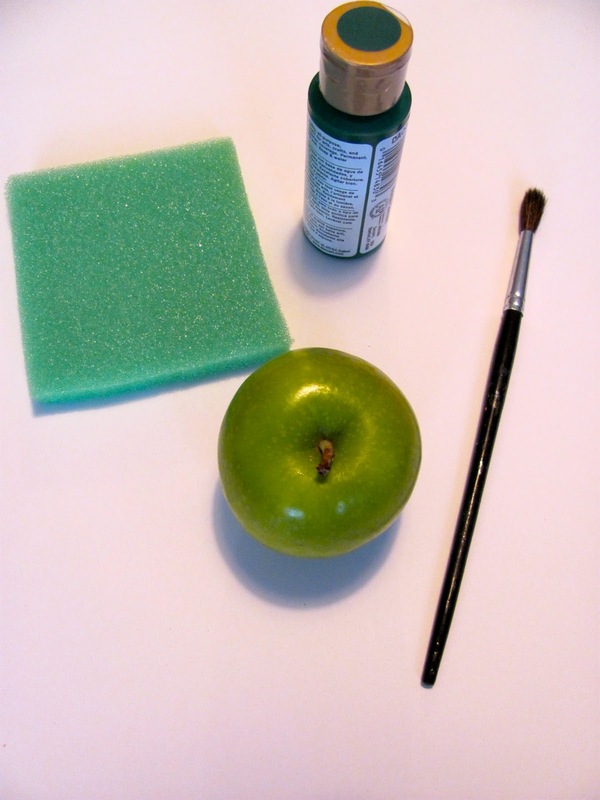 First, I dabbed the green paint on the sponge and spread it with a brush to cover a surface big enough for the apple. 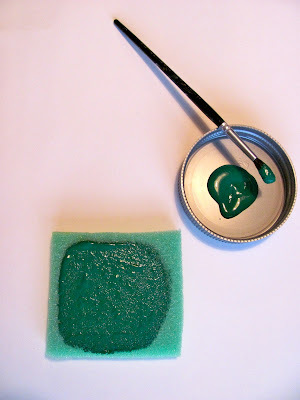 Test it to see if there is enough paint on the sponge before you do a final print! 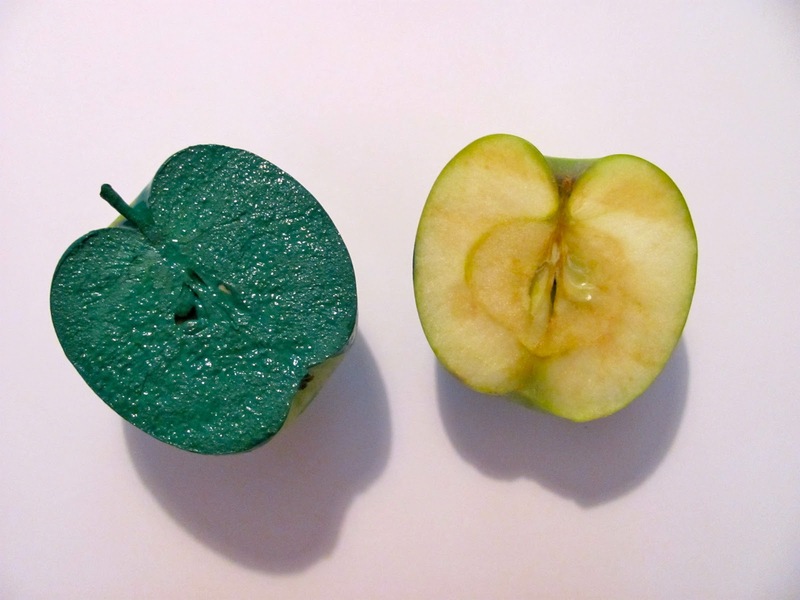 Cut the apple in half very evenly or it will be difficult for a child to get the whole apple printed!! If you don't cut it straight, you will have to rock the surface of the apple back and forth for it to print the whole surface of the cut apple. If you don't have a sponge you could alternately paint the cut apple surface and print it that way too. 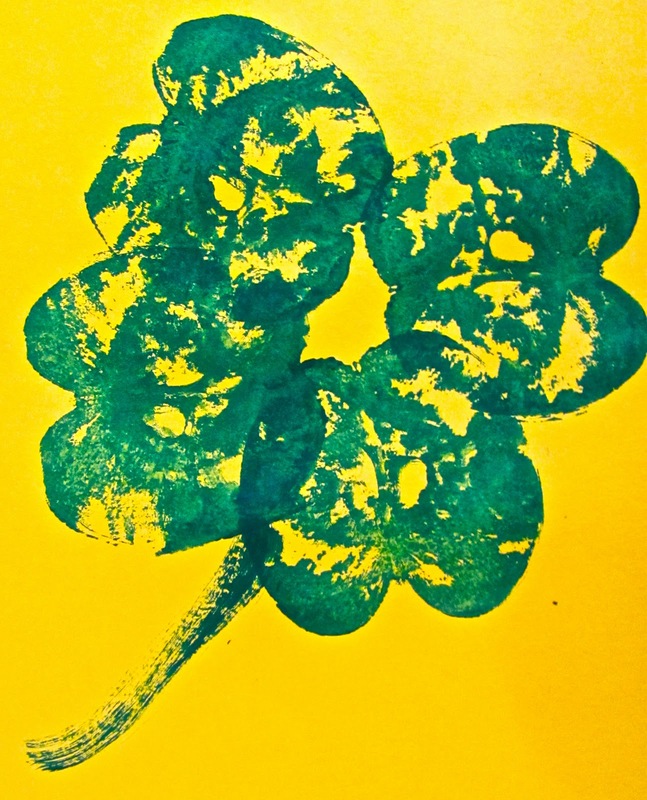 We tried printing shamrocks (3 leaves) and four leaf clovers and just added a stem with a brush! The tricky part is making sure to turn the apple so that it is the same direction all around! Have fun and don't worry if it isn't perfect! That is the beauty of printmaking! 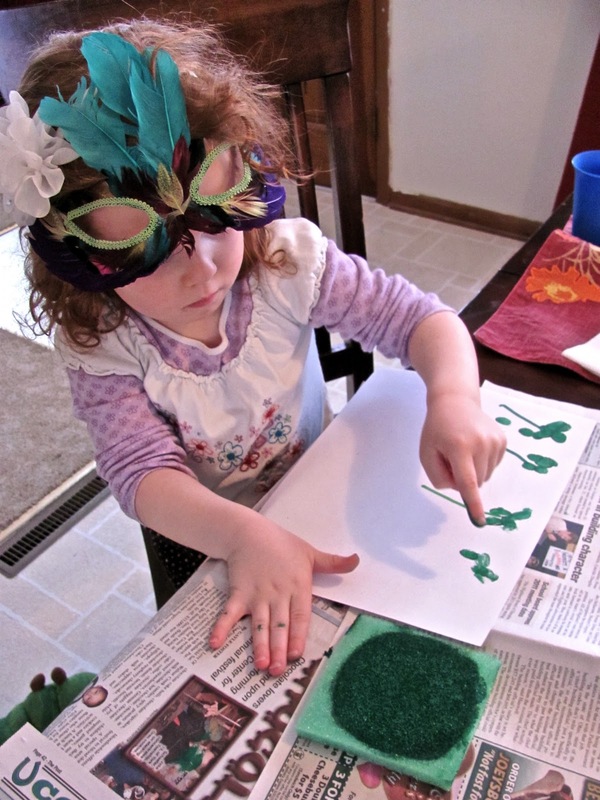 We experimented with using our fingerprints as the leaves of shamrocks too! That was definitely FUN! Cassie really enjoyed this too! We used green marker for the stems. Don't you love the Mardi Gras mask? FInished fingerprint shamrocks: What kid doesn't love using their fingerprints to create Art? We also learned about drawing shamrocks. Make one circle on top and two on the bottom and add a stem. My daughter has been drawing these like crazy all over the place. Also, we added a little learning about rainbows and the proper order of the colors ROYGBIV! Red, orange, yellow, green, blue, indigo, and violet. I set out the markers in the proper order and she followed along to create this precious rainbow! Check out the children's group: They Might Be Giants and their: Here Comes Science DVD/CD combo that has a great song about Roy G. Biv. It is a great science resource. It actually was nominated for a Grammy too!! Roy G. Biv is a colorful man.........don't get me singing this! I posted the video for this in my next post!!! Aaaaaahhhhh how clever to use the humble apple print and the oh so cute fingerprint to make Shamrocks! I LOVE! Very very sweet! Thanks for linking up! Really great to see you there! Thanks Kerri! Thanks for stopping by! We did apple prints this week, too! But I never would have thought to make them into 4 leaf clovers. SO clever! Yes---this idea just came to me----never would have thought of it before either! Thanks for stopping by! These are great! I love apple printing! And potato printing! What other produce can we paint with?? Thanks! The possibilities are endless! I really like your assortment of shamrocks! The finger print ones have to be my favourites. So tiny. LOVE LOVE LOVE They Might Be Giants and all the songs and podcasts they do for kids! I sing The Element Song all the time! How fun are they? @ Michele thanks---I should post the fingerprints separately! I love TMBG--- even before they were a children's group! @ Jess--- Thanks! I love the drawing and it having on our front door! So simple but so big on fun. I'll be featuring this on Fun For Kids Finds tomorrow. Thanks for linking up! Love it! What a fun and simple project and they turn out so pretty. Great Idea, my little man would love doing this! I would have never thought to use an apple to create a shamrock! How clever!!! Thanks for linking up to For the Kids Fridays at Sun Scholars. I can't wait to see what you have to share this week! Love the apple shamrocks. Who knew apple stamps could used to make so many things. I used them last fall to make pumpkins. I will have to try this with my son. Thanks for sharing! This is adorable! I love the way it came out! I am a new follower and I am having my first ever linky party for kids activities and I would LOVE if you would come link up this project! Hope to see you soon! Thanks so much for linking up to Made by Little Hands Mondays! I love love love this sponge technique! So Smart! Such great ideas! Had no idea that painting shamrocks were that easy. We are going to have to break out the green paint next year. Thanks so much for adding this to the party! What a wonderful post, thanks so much for sharing htis with us. Easy peasy toddler activity! Thank you! I included it on my "A Peek at My Pinterest" St. Patrick's Board post.